I’ve been lucky enough to work on more exhibitions than I can count – as a staff member, as an intern, as a consultant, and through collaboratives helping other institutions. Yet after 22 years in the museum business, I’ve just participated in my first exhibition as one of the crowd – a contributing audience member. So when I read that London’s Science Museum had teamed up with Stitch on the new Identity Exhibition that they were opening at the end of June, I was all eyes (and ears and knitting needles). A knit museum project has my name all over it. The call went out for knitted self-portraits to be displayed in the exhibition. Now, the wording was a little vague – it definitely sounded to me like there was a call out for little self-portraits that would be a permanent part of the exhibition. I got quite excited about participating, which then rubbed off on my daughters, aged 6 and 9 at the time. How fabulous, I thought, a lasting legacy in one of London’s major museums that would last (for at least a couple of years) after we’ve moved back to the United States. So, on a train from London to Brighton, the knitting needles came out and our naked knit selves started to take shape. I knit the first doll and then thought about how to size the rest. The first one ended up being the 9 year old and I made one with a slightly longer body for me. This didn’t look too different to me, so the 6 year old ended up with shorter arms and legs. They look a bit like freaky aliens in their naked form, but here we are. So then it came time to make the clothes. Unfortunately, I’m not much at sewing. The knit group suggested that it’s easiest to make clothes from felt (rather than knitting small clothes) so I went that route. I almost always wear jeans and had just made some cut-offs, so I started to sew my mini-me a pair of jeans. I made the mistake of trying to sew them inside out so the seams wouldn’t show but then couldn’t get them right-side out since the legs were too narrow. I also had several problems with shirts since proportionately, the heads are enormous and the bodies’ quite stout for the skinny little arms and legs. In the end, what I thought would take me an hour took a bunch of days with big breaks in between. At this point, we are almost to the deadline of when our knitted selves need to be in East London. The final email came through…..and I learn that the knit selves would only be on display for the adults opening on the evening of Wednesday, June 30th. Sad, but I figure we’ve put in the work, so I spend about four hours on several underground subways and trains and hand delivered the dolls to the address in East London on the due date. My husband and I don’t have a very active social life, but June 30th happens to be one night we’ve gotten a sitter and are going out to meet a friend downtown so we knew we wouldn’t be able to see the display. 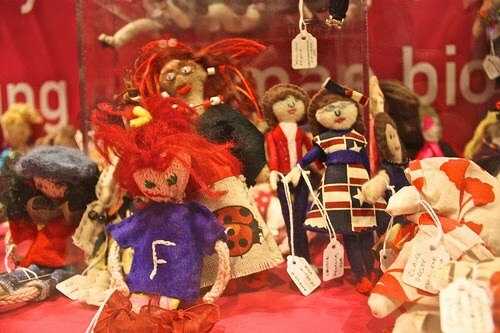 Plus, the evening event was adults only, so the girls were sad not to see their dolls proudly displayed at the Museum. But we were proud of our dolls, might as well be part of the action and how many self-portraits will they get, anyway? Well, 259 to be exact – some from Australia, Abu Dhabi, Israel and all reaches of London. I didn’t make it to the exhibition, but my fellow knitters didn’t let me down and posted lots of pictures. Here’s a photo of the case and a close up of me and Francesca (Laila is just to the left of the Lucite box and out of site from this angle). Angry Francesca is up front and center and I’m behind to the left in the replica blue hat I wear around all winter. And here are all 259 of us. And what did I/we get out of all of this? A definite appreciation for all the work that the public does when contributing to something they know will be seen in an exhibition. My family easily spent 15 hours knitting, planning, cutting and sewing our little selves and ours aren’t nearly as ambitious as some. I am truly amazed and inspired by some of the self portraits contributed for their creativity, workmanship, and sense of humor. The Stitch folks also worked really hard and catalogued all dolls and labeled them all uniformly. The staff at the Science Museum assured that there was a case up and running and provided help with setting up the display. All and all, a great effort for something that in the end was a small piece of one special night. Even though my mini-me is no longer there (but will be featured at upcoming Stitch events around London – we’ll keep you posted) I will be going to see the identity exhibit this week. Not only am I curious about the exhibition, but I do feel connected to it and to the organization as I think this was a pretty funky and cool partnership for the Science Museum to explore. I love exhibits that meld science and art and architecture and craft and am glad to see that happening in the city around me. Imagine how connected I would feel if my mini-me was permanent? I’d be emailing all my friends and sending them to the Museum to check me and my girls out! More about the project can be found at the stitch blog. Check out the self-portrait in process of knitting her/himself, dolls with glasses and stuffed animals, and even one in roller skates (keep in mind, each doll is approximately 6 inches tall). And be prepared to pull out the stops and participate in an exhibition coming to a Museum near you! This is the fifth and final post in a series on children's museum names. In my first post in this series I mentioned that I compared two ACM directories 10 years apart. In that time the children's museum community saw an astounding boom in numbers - in fact, between 1997 and 2007 ACM membership more than doubled. And part of my interest in analyzing the names in the ACM membership in the first place was curiosity about whether naming had changed over that same time period. So far I have been focusing on the 2007 membership - that formed my baseline. But once I had a pretty clear picture of those organizations names I wanted to look for trends: are names changing over time and if so, in what ways? The other question was - if I found a trend, was that due to new museums, or were established museums changing their names? So I did some calculations to look at name changes between 1997 and 2007. Over that decade 38 museums, almost 19% of the ACM membership, changed their name. It turns out that most museum name changes are relatively small. 20 of the organizations that changed their name started out as “Children’s Museum of ____” or “_____ Children’s Museum”. Their name changes focused almost entirely on the order of the words in their name, switching the name of their town or region to either the front or the back of the name! The only exception were two that added a major donor to the name. Not only were the changes small but arguably not that meaningful - at the end of all these switcheroos half of all ACM members with this type of name have their town at the end, and half at the beginning. So these changes do not point to a larger trend. 8 of the museums that changed their name in the decade between 1997 and 2007 incorporated some of the words “discovery”, “imagine,” and “explore.” Given that 121 museums in the ACM directory describe the activity - what it is visitors actually do - as a key part of their name, this does strike me as important. The percentage of museums focusing on the visitor experience in their name is growing in part because existing museums are changing their names to incorporate this information. Looking at new members who joined ACM between 1997 and 2007 this trend toward promoting the activity - over audience, or place - begins to emerge even more strongly. If museums are simply moving words around in their names, why bother? And why not use the opportunity as a chance to try something more unusual? Why is the word “kids” the second most popular way to refer to audience? Is it seen as a way to be more playful? Or an attempt to balance out the formality of “museum”? Why not use “family”? Who is the audience for the name? Which names are intended for an external audience - potential visitors, donors, and partners – and which are more internal? Is the choice to use a made-up name a sign of organizational culture? 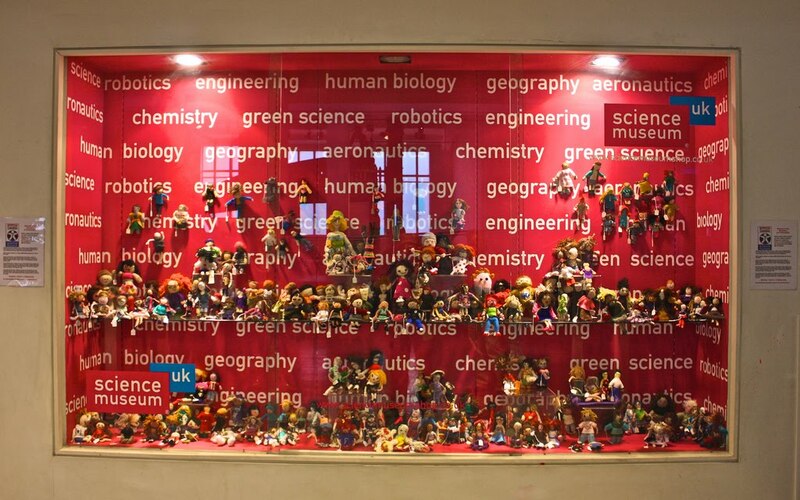 Does the move away from “children’s museum" signal the emergence of a new model? That seems true for places like Zeum, which offers project-based experiences with heavy staff facilitation, and Explora, which is a fusion of science, art, and inquiry that many wouldn’t recognize as a children’s museum. What does the audience call these organizations? Do they still say “let’s go to the children’s museum?” on Saturday morning or do they say “let’s go to “i play”? This is the fourth post in a series on the names of children's museums. 49 ACM members have invented words in their name. In addition, a number of other organizations have whimsical, playful, names that use real words. In all, I counted 103 alternative names - that is approximately 30% of all ACM member names. That's a lot. So for instance, 28 ACM member organizations describe their site using a word that signals this is a place but using a word other than “museum.” Moreover, the types of places that these organizations are comparing themselves to tend to be ones that kids would choose to go to. Examples include: EarlyWorks, Fairytale Town, and InterActive Neighhborhood for Kids. These names communicate that this is a visitor center, rather than a program or public service, and that it will be a favorite place for kids. The Children’s Favorite Games category is small, only 7 that I could see, but they describe a wide range of activities from telling jokes - Knock Knock Children’s Museum – to imaginative play - Pretend City – science games – Kaleidoscope – perennial favorites - Marbles Kids Museum – physical play - Stepping Stones –mind-bending problem solving - The Magic House, St. Louis Children’s Museum – and creative self-expression - Young at Art. 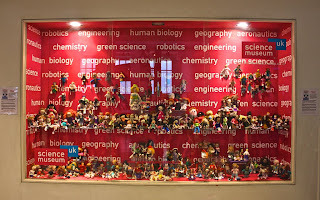 The 10 names that emphasize that visitors will have a Learning Experience during their visit are sometimes explicit about this, as in Schoolhouse Children’s Museum, Imagination Workshop, and Sony Wonder Technology Lab. At other times these names are indirect about the style of learning and focus instead on the fact of learning: as in The Children’s Metamorphosis, Above & Beyond Children’s Museum, and Bakersfield Adventure for the Mind. This is an interesting category because many children’s museums have staked out playful, joyful family learning experiences as the core of their business. At the same time, many of these organizations have focused on process learning and skill building. Yet ten museums have decided to emphasize that kids will learn from their relationship with the organization. And a number of those have referenced a fairly formal learning model - schools and labs. As I noted previously, 28 Museums refer to audience in their name using a word other than children. Of those, many use audience playfully as in MY Museum, Kidsenses Inc., and Habitot Children’s Museum. The goal of these names seems to be communicating age appropriateness. 57 of the alternative organizational names are based on a description of what it is visitors will do – the main experience: EdVenture, I play Children’s Museum, Wonderscope, and Great Explorations, are a few of these. Many of these, not surprisingly, describe inquiry-based experiences. This is the third entry in a series on Children's Museum's names. As far as the truly invented names that caught my attention initially, it turns out that 19% of the ACM membership – 49 organizations - have decided that there are no existing words that adequately express the idea of a joyful, learning environment for children and families, and have made up their own words that sound a bit like a place, a bit like an activity, and in some cases also try to signal who they are for. This is not to say that those organizations have completely abandoned the three most common components of a name: children, museums, and location. The Explorium of Lexington is a perfect example of this blending of fantasy with familiarity. So traditional words that indicate audience, place and location are being used as a way to anchor a name, and make it clear what type of organization it is, and reinforce its local roots, while at the same time allowing for some wordplay. The standard naming components appear to be useful, but not always sufficient, to communicate the spirit of an organization in the ACM family. Remember about a decade ago when businesses started using single words, and turning nouns into verbs and adverbs, to create new kinds of names? Friendster, Performancing, Farecast, Meetro . . . In that context, Imaginarium - well, it has a context. There is also something to be said for using a name that expresses the personality of the organization. Perhaps telling kids that this is a museum for them, the way "children's museum" does, can't capture fun and engagement the way whimsy can. Audiences are changing so it would not surprise me to think that names are responding to this with more subtle and invitational language. We also know from our own survey of Children's Museums that the practice of these organizations has been changing. Not all museums focus on exhibits, or even offer them. And as museums test new strategies for diversifying their audiences they are looking at all aspects of their brand. So perhaps the word "museum" is not always a comfortable fit. All of this suggests that the search for an alternative name is real. And yet there is ambivelance. What I see in the combination names is a concern that audiences won't know what an "imaginarium" is. This is a key issue and an Aha moment for me. There are more than one audience for a museum name, and how an organization describes those audiences significantly informs their choices. For example: Is the name for funders? for the audience? for the professional community? for the staff? If your museum has had a name change, or been through a branding process and had this conversation, we would love to hear from you. Next up: What's the Alternative?